Re-designed for 2010 the Tac Med Solutions R-AID Bag is now more versatile and user friendly than ever. Its new clamshell design allows the bag to be opened completely or to be used in the same satchel configuration as the original design. 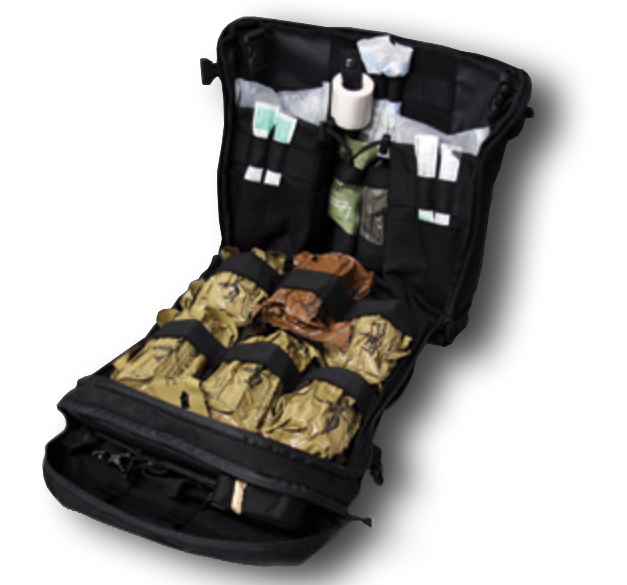 Other features include the ability to hang the bag so it functions as a medical panel in tactical vehicles or aircraft, keeping the bag off of the floor and out of your work space. The shoulder straps now allow for rapid adjustment and can also function as a waist strap if the bag is mounted directly to the body armor. The R-AID bag is ideally suited to work as an assault aid-bag, vehicle bag, or combat lifesaver bag. All critical intervention items are loaded in the top flap of the bag for immediate access. The second main compartment is for items required for additional treatments and casualty packaging. The rear sleeve is perfect for triage and casualty marking materials as well as splinting material. The bag provides one of the most compact, comprehensive treatment kit platforms available.